When a dog is surrendered at an animal shelter, there's always a deep sense of disconnection. No longer someone's pet. Unplugged from everything she thought she knew in life. Maybe that's why Muneca was so eager to make a connection when she arrived at the Baldwin Park Animal Care Center in Los Angeles. 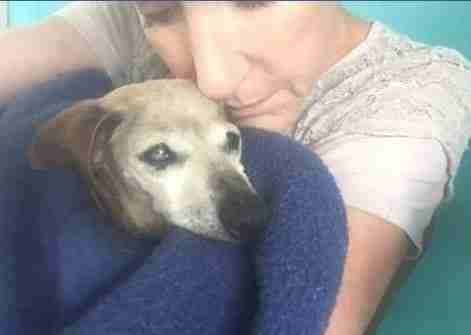 Especially since the 18-year-old dachshund had already lost more than most - not just a home and an owner, but also her vision. When longtime volunteer Elaine Seamans paid Muneca a visit on Tuesday, the blind, flea-infested dog leapt into her arms - and never wanted to let go. But Muneca found two friends in that moment. John Hwang had stopped at the shelter with his camera. He was on his way to take pictures for a photography project involving LA's Skid Row. Seamans had asked him if he would like to take pictures of another kind of homelessness. The kind that leaves unwanted pets in a bustling shelter. 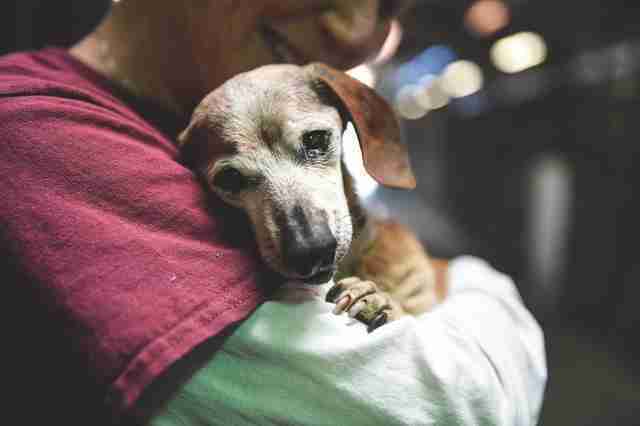 "When I got to the shelter, Elaine was already holding the dog," Hwang tells The Dodo. 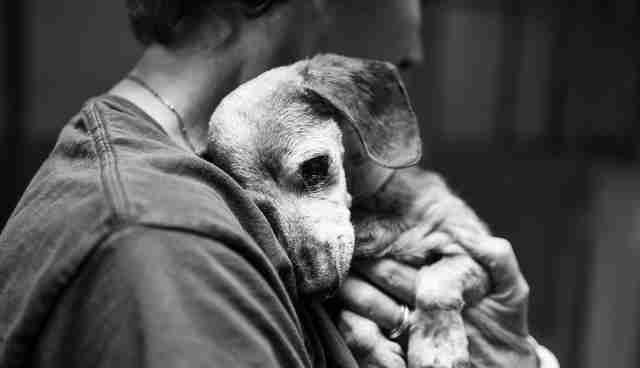 "The dog was clinging on to her." "Elaine is so amazing with the dogs," he adds. 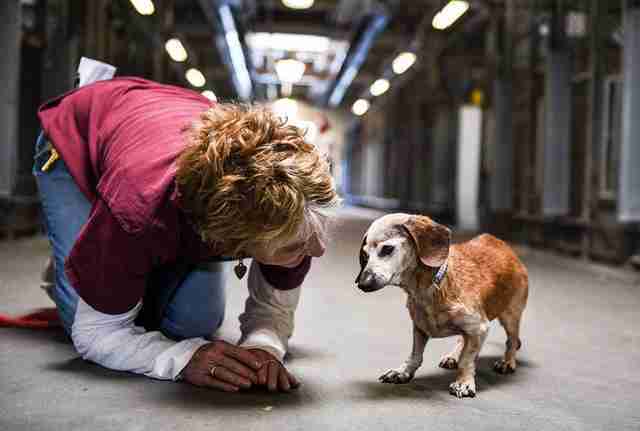 "She'll roll on the ground with the shelter dogs. She'll kiss them. She really has a special chemistry with them. I love capturing that." It wouldn't be the first time a shelter volunteer shared an intimate moment with a lost, disoriented new arrival. In fact, these candid scenes play out in shelters every day, where compassion rises to meet the tide of incoming animals. But this time, someone managed to capture just one of those moments. "Ultimately, the person who sees the photo - I want them to feel something. I want them to feel a connection," Hwang says. "If I can capture the right sort of connect, then the person who sees the image will feel it too." It turns out Hwang's pictures helped Muneca make an even greater connection. Shared on Facebook, they caught the eye of a rescue group called the Frosted Faces Foundation. After spending just two days at the shelter, Muneca was on her way to see a veterinarian in San Diego on Wednesday. From there, she will be fostered until she makes the most important connection of all - with the person who gives her a real home. Think that could be you? Apply here. And if you would like to help give Muneca the care and love she deserves, consider sponsoring her here.